CATFISH LAKE HOME- "Wow" is all that comes to mind when seeing this property. Eagle River Chain, CHECK. 2, 700+ square feet, CHECK. 3 bedrooms/3 full baths, CHECK. 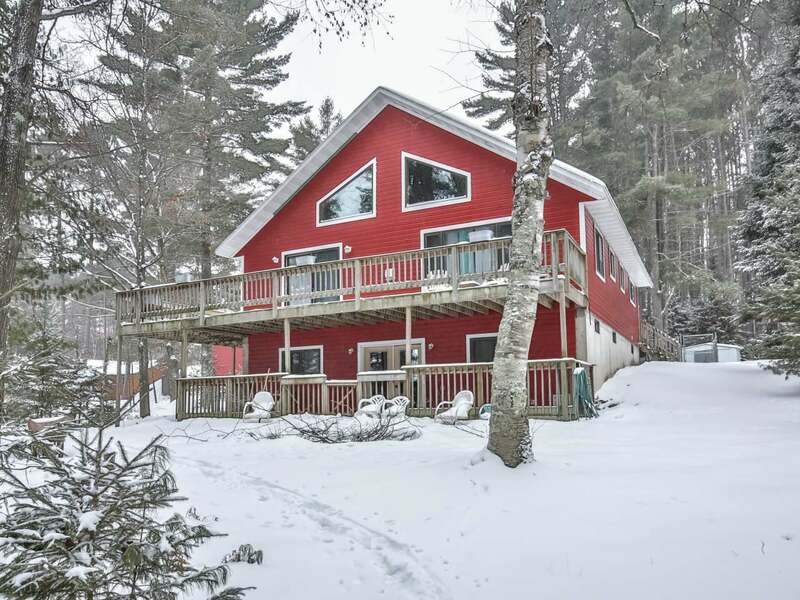 Built in 1998 this chalet style home oozes Northwoods charms with its wood flooring & paneling finishes. The floor to ceiling windows provides views of the water from the cozy living/dining room attached to the large wraparound deck. The Master En Suite with private deck & full bathroom are on the main floor as well as the 2nd bedroom & bathroom, while the upstairs loft area could provide additional sleeping space if needed. Meanwhile the lower level houses the family/rec room w/dry bar, the 3rd bedroom with attached bath, utility/laundry/storage room & sliding glass doors to the lower level patio. Additional features include the natural gas fireplace, central air, fenced in dog kennel, pier & 800+ sq. ft. heated 2-car detached garage. With lack of inventory on the chain, this package is worth taking the time to view!